Home › Home and Kitchen › Lagostina Q555Sd Axia Tri-Ply Stainless Steel Dishwasher Safe Oven Safe Cookw..
Lagostina Q555Sd Axia Tri-Ply Stainless Steel Dishwasher Safe Oven Safe Cookw..
Each piece of Lagostina cookware represents quintessential Italian culture.Celebration of food, life, family and friends. Of memorable gatherings aroundthe table. Of spirited conversation. Since 1901, Lagostina' s core values ofimpeccable Italian craftsmanship, high-quality materials, technologicalinnovation and elegant design have endured. Today, as Italy's premium cookwarebrand, we continue to stand behind these core values with a lifetimeguarantee. 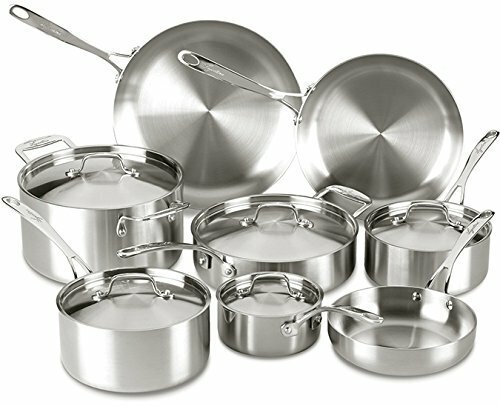 The set includes 8-Inch Skillet, 10-Inch Skillet, 12-Inch Skillet,1-Quart Covered Saucepan, 2-Quart Covered Saucepan, 3-Quart Covered Saucepan,3-Quart Covered Deep Saut Pan, 6-Quart Covered Stockpot.